Join us for a Civic Dinners conversation exploring how we understand gender and support and celebrate the power of a women’s voice. From the workplace to the boardroom and the streets to the living room, women are challenging stereotypes and gender roles. Yet, here we are in 2018 and misogyny and bigotry dominate national and international headlines, sexual harassment transcends all industries and street corners, and critical programs that support women’s ability to live healthy and fulfilling lives are on the chopping block. By sharing stories we can begin to understand one another, our personal struggles and our collective struggles, and together commit to amplifying the voices of women in America, and beyond. Join us as we share stories and discuss values central to women’s rights in hopes of creating a new social contract. Select one to jump to the appropriate section of this toolkit. Gather 6-10 friends, peers, colleagues and neighbors for dinner for a conversation exploring how Join us as we share stories and discuss values central to women’s rights in hopes of creating a new social contract. Simply go civicdinners.com/theracialdivide, click "Host a Dinner" and add your specific dinner details to create a custom dinner page to send to your guests to register for your dinner. All information regarding the conversation is automatically set, including email reminders and follow-ups sent to all guests and you as the host. Here are some things to keep in mind. Choose a date and location. Go to civicdinners.com/voiceofwomen and click “Host a Dinner” to setup your dinner. Write a note to the women you brought up during the introduction. Take time to celebrate people who have made an impact in your life. YOU are amazing! Thank you for diving in and being 1 of 1000 Civic Dinner hosts for amplifying the Voice of Women! We've created copy/paste messaging to help recruit attendees at your dinner. I'm hosting a Civic Dinner on the Voice of Women on [insert date and time] at [awesome location of your Civic Dinner] and would love it if you could make it! This isn't just any dinner. This conversation is one of hundreds happening across America. It's all about bringing people of different racial and ethnic backgrounds together to share stories and experiences around women’s rights, power, and femininity. The hope is to gain a greater understanding of one another, our personal and collective struggles, and celebrating what it means to be a woman today. You can anticipate some good food and good company, and some really meaningful and important conversation around how we can bridge the racial dividesupport and celebrate women in our community, in America, and beyond. I think talking about our experiences among family, friends, and colleagues will bring clarity and hopefully some solutions we can forward on to those ready to help. I'm hosting a Civic Dinner! Join me [insert date and time] for a night of meaningful and important conversations exploring women’s rights, power, and femininity. [TAG @CivicDinners] is looking for leaders across the world to host a ivic Dinner conversation on Bridging the Racial Dividethe Voice of Women. You'll join a movement of hundreds of conversations happening starting in September as part of a celebration leading up to Women’s History Month in March 2019. Getting started is easy. Just sign up to host, select a location (your house, a quiet restaurant, or a conference room in your office), invite a diverse group of friends and neighbors, and download the step-by-step Host Guide that includes everything else you'll need. I'm hosting a Civic Dinner as part of hundreds of dinner conversations across America starting in September! Join me [insert date and time] for a night of meaningful and important conversations around how we can support and celebrate the voice of women. 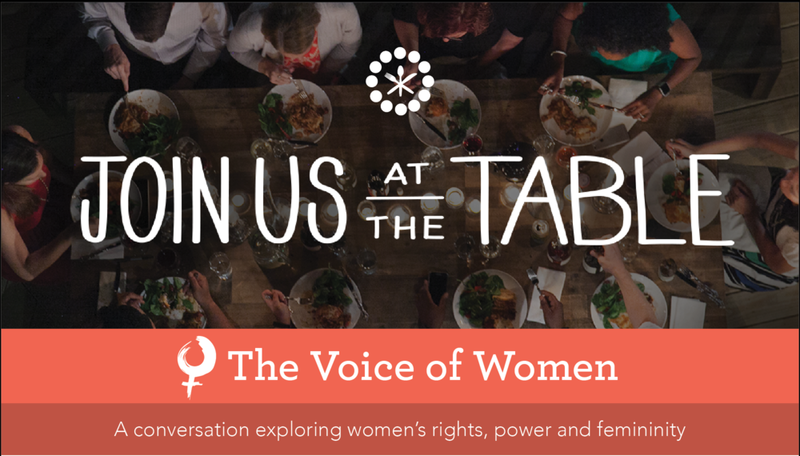 Join us at the table for a conversation exploring how we understand women’s rights, power, and femininity as we support and celebrate women to collectively build the Beloved Community. This conversation aims to bring people of different backgrounds together to share stories and experiences around women. By sharing stories we can begin to understand one another, our personal struggles and our collective struggles, and together commit to amplifying the voices of women in America, and beyond. You are invited to the table for a conversation exploring how we understand women’s rights, power, and femininity as we support and celebrate women to collectively build the Beloved Community. For the next year, hundreds of Civic Dinners will take place across America with the aim to bring people of different backgrounds together to share stories and experiences around women. By sharing stories we can begin to understand one another, our personal struggles and our collective struggles, and together commit to amplifying the voices of women in America, and beyond. We are proud to bring together people for this important conversation and see it as a great way to engage, and celebrate, our local partners, families and community leaders.